This is a photograph showing a Holland-style windmill built in Lawrence, Kansas. Construction began on July 1, 1863 by by A. Palm and G. H. Wilder; however, it was destroyed in Quantrill's raid. Fourteen men were brought over from Sweden to work on the windmill, and it was rebuilt in 1864 at a cost of $9,700. It had an octagonal shaped frame, four stories in height, and a basement with walls of stone six feet thick. The mill had four millstones, two for wheat and two for corn. 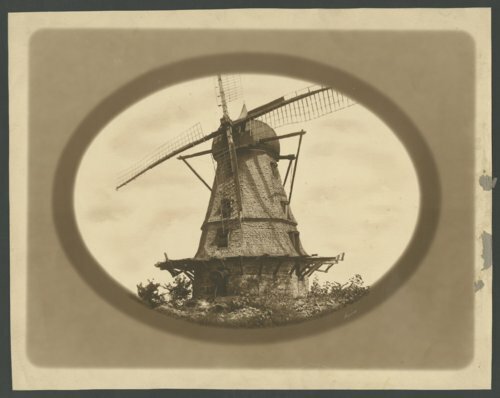 The capacity of the windmill was twenty bushels daily each of flour and meal. Also, it furnished power for a wagon and plow shop. In July 1885, the old windmill ceased to run and in April 1905, it burned.